After 4 long days, the Ecole Polytechnique Executive Education “IoT Level 1” program has come to its end. Covering everything from introductory networking concepts through advanced architectures and a multitude of protocols, the first half of Level-1 of this program was to really understand “the why” of why protocols are designed the way they are – and, in particular, what the consequences are of design choices made. This is particularly important, of course, in an IoT world: when you have to make design choices because your devices are constrained (memory, computational capacity, channel capacity/bandwidth, battery capacity), you better understand the complete spectrum of consequences of your design choices. So, we studied the whole IoT stack: from IEEE 802.15.4 and 6LoWPAN over the routing protocols RPL and LOADng, and up to an including CoAp – systematically and critically trying to uncover the rationale for the design choices made, and understand their consequences. We talked constrained networks, and sensor networks. We talked protocol and IoT systems design. And we talked a little IoT business models also. A motivated and energetic crowd of attendees, the discussions were intense and interesting (at least, for me) – in no small part due to the very diverse background of the attendees. 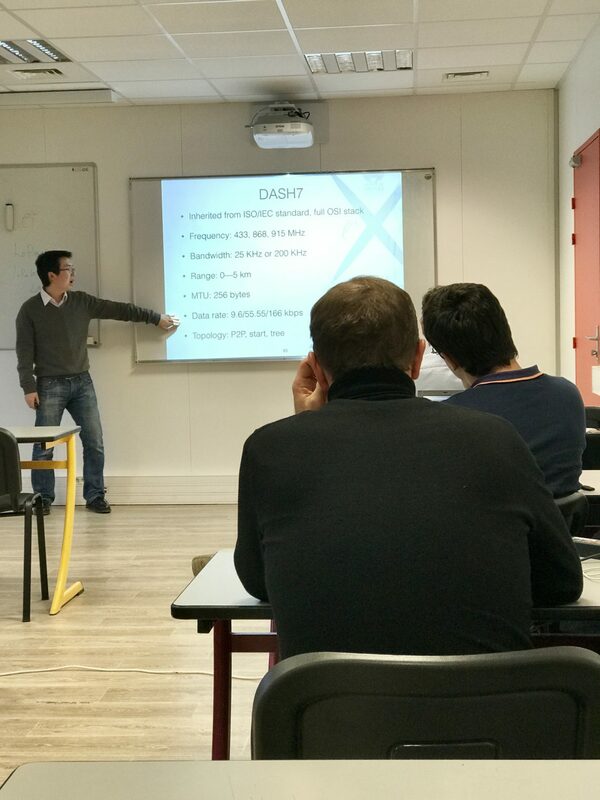 Jiazi Yi closed off the event by giving a great LPWAN (Low-Power Wide Area Network) overview, and an in-depth tutorial of LoRa..
Can’t wait to see all y’all for Level 2 in early 2017, for advanced topics such as IoT Security, IoT Safety, IoT Operating systems, and Data Science for Sensor Data. There’re still a few spaces left for the program for 2017 – Want to join us? Thomas is a real marathon runner ! For 4 full days without seating, he explained clearly and with passion all the secrets behind the protocols. Thank you to the 2 Thomas for the organization. Definitely looking forward to seeing you (& all the others) again in January. Have a great December! I was sure that a coffee cup was a router… did I miss something during these 4 days ?